Welcome back to the MCG, Adelaide. We loved your last visit here to play the Tigers and are hoping for more of the same tonight. It’s also a welcome return to Friday night footy for the Tigers, our second for the season and the first at home. We’re here to see the Tigers march towards September, braving the chilly 12 degree evening up on level 4 of the Ponsford stand (the only option if we want to sit together). The mood is jovial with different groups of supporters chatting happily. This is the effect of backing up a premiership with 14 mostly great games of footy. No one is nervous, but there’s no arrogance. We’re just happy to be here – thoroughly enjoying footy – after so long in the wilderness. But to anyone wondering why we’re not sitting at home watching the telly with the heater on, the answer is obvious as we spy the Channel 7 commentary team on the boundary line. Not having to listen to BT and Lingy commentate is a compelling reason to come to the ground. The game starts with the ball camped in Adelaide’s forward 50 for little reward. The Crows have three behinds and one goal before the Tigers hit the scoreboard. The first quarter is a battle of the game styles. The Crows want to slow the game down, but that’s not what we want. Without panicking, the Tigers adapt and get the game under their control, kicking inaccurately at first but finishing off the quarter with emphatic goals to Jack Riewoldt and Daniel Rioli. The other reason we’re here at the game is that we can actually see the game. We can see the play unfolding on the expanse of the MCG. With the TV coverage moving more and more to tight shots of just one or two players it’s frustratingly hard to get a sense of what’s going on. 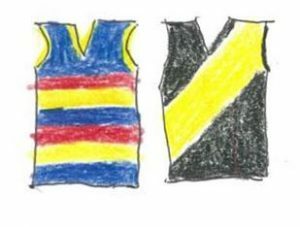 Here at the ground we can see whether a kick or a handball is on, we can see who’s open downfield and we can see the Tigers’ pressure – real and perceived – causing the Crows to doubt themselves. The Tigers dominate the second quarter. The Tigers brush aside Adelaide’s attempts at slow play and bring excitement into the game. The party tricks are on display but not limited to just one or two star players. The whole Richmond team has the confidence to tap the ball to advantage, sell some candy, open up the play with a sneaky no-look handball, and even fend off a tackler with a don’t argue. These small acts have the crowd up and roaring and would have overflowed to frenzied excitement if Jack had not dropped mark of the year. Luckily he recovers to gather the ball and snap a goal. But don’t get the wrong impression. This was not a mistake-free game. Jayden Short will be regretting giving away a free kick for running too far – in Adelaide’s goal square – to give Josh Jenkins the easiest of goals. But this didn’t make us worry. We’ve come a long way to have a mistake in the worst possible place seem like a hiccup rather than a game-losing disaster. The third quarter is the lull before the storm. But for all their effort, Adelaide only claw back one goal on the scoreboard. So far, the Tigers have combined to put on an even performance, sharing the goals and sharing the play, not relying on any one player’s brilliance. And as we are used to this season, the Tigers step up a gear for the final quarter and kick six goals to Adelaide’s one to win by 47 points, one less than the margin in the grand final. Richmond: Edwards, Lambert, Martin, Prestia, Astbury, Grimes, Cotchin. Adelaide: Crouch, Sloane, Laird, Doedee, Jenkins, Gibbs.